The issue of Catalonia is a challenge for the European Union. A new internal crisis in the EU could emerge, when other crises are still far from being resolved, such as the euro crisis, the migratory crisis, the Brexit, the internal threats from radical Islam, the geopolitical destabilization of the southern flank of Europe, the crisis with Russia and also with the United States since the election of Donald Trump. European law provides for the exit of EU from a Member State but does not mention the secession of the territory of a Member State. the EU therefore considers this to be an internal matter for Spain. This new crisis is nevertheless likely to further fragment the EU, due to the disagreements between Member States and European institutions on the management of this deepening crisis. 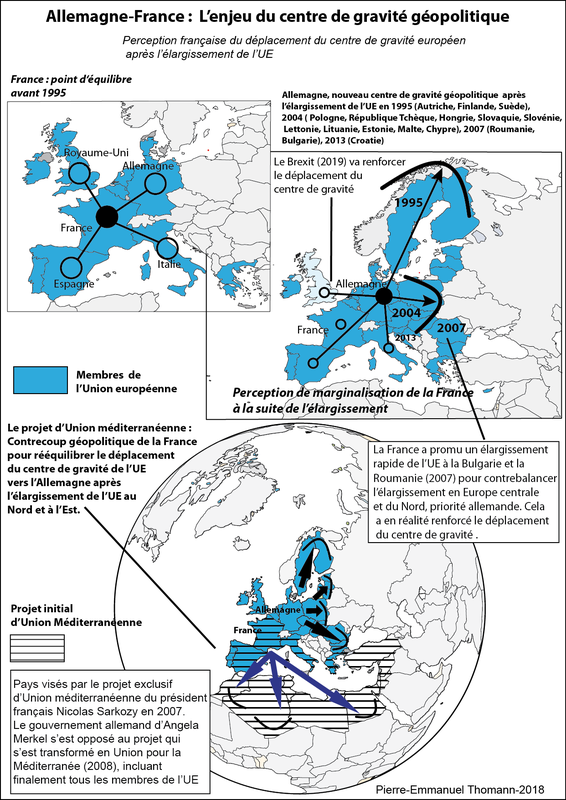 Rival representations on the purpose of the European project might emerge again at this occasion: a Europe of Nations? a Europe of Regions? a Federal Europe? – The Brexit since the United Kingdom decided by referendum to leave the EU. The longer-term consequence is the possible risk of an independence of Scotland, since the majority of Scottish citizens wanted to remain in the EU according to the statistics of the Brexit referendum. – The case of Catalonia, a region / nation seeking independence from Spain; but both entities want to remain in the EU. These different processes are different, but they are the result of the multiplication of claims of sovereignty at different levels. This is the result of the process of decomposition / reconfiguration of the EU and the territory of states in contradictory directions, as a result of European integration and globalization processes. These different processes have each their peculiarities, but they are the result of the multiplication of claims of sovereignty at different levels. This is the result of the process of fragmentation / reconfiguration of the EU and the States in contradictory directions, following the transformations resulting from European integration and globalization. European sovereignty remains a utopia, as the European Union is not a nation. The European Union's paradigms have so far relied on the notion of shared sovereignty, and this has often resulted in a division of sovereignty and not a gain of sovereignty. 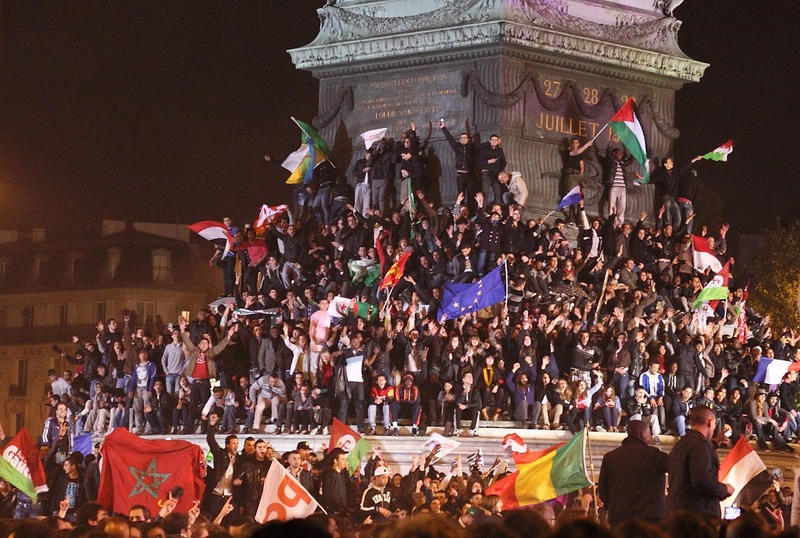 As a result of this, citizens in Europe are asking for greater sovereignty at national and local levels. 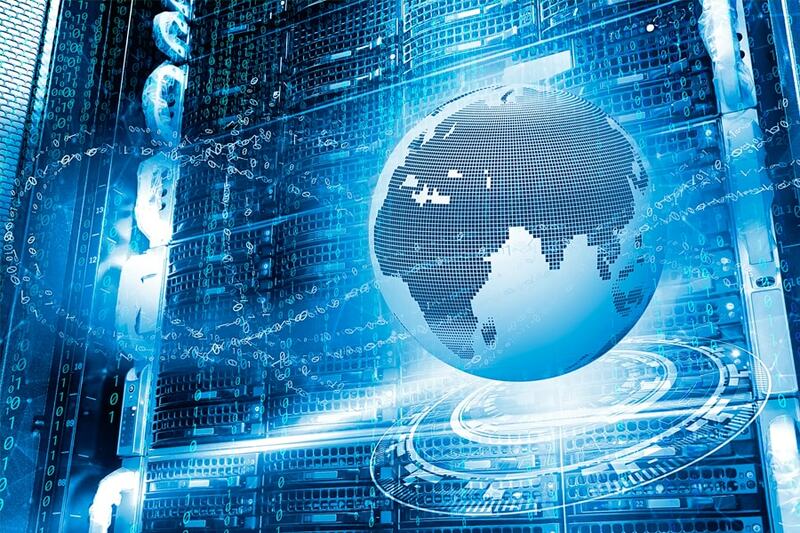 The Euro-globalist ideology (see the EU's global strategy, 2016), which permeates the European institutions, but also the governments of the most influential Member States considers EU as a laboratory of globalization, and not an autonomous entity with well-defined boundaries and interests. This model promotes an open, liberal and multicultural Europe, that is, with porous borders favoring mass immigration and causing the weakening of nation states. The result is a deterioration of security, including cultural security, on national territories, and results in an increased demand for sovereignty as a reflex of self-defense. Since the European Union was originally conceived for the purpose of abolishing borders, a reverse movement has begun among nations. This is more demand for national borders (Brexit, Schengen crisis),and reinforcement of identity (regional and national independence). This geopolitical crisis has obviously repercussions at different levels, local, national, European, pan-European, global: the question of the unity of Spain at national level, the possibility of a domino effect at EU level with the likely strengthening of the independence movements in other Member States, and on a global scale, the movements of territorial fragmentation and reconfiguration that have accelerated since the disappearance of the bipolar world. 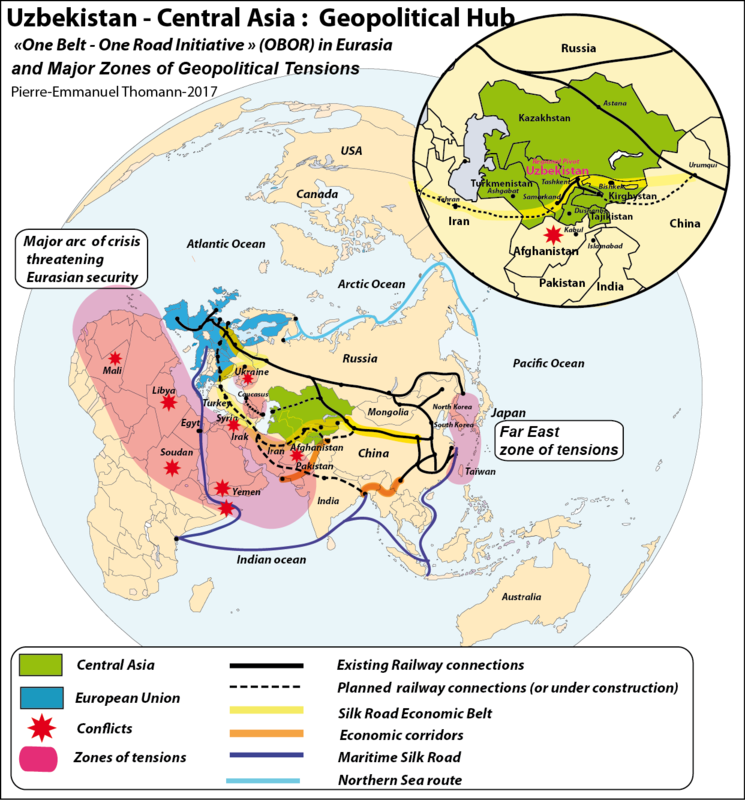 Looking at a map of Eurasian border changes since the end of the Cold War, we notice that more than 15,000 km of new borders have been mapped out since the end of the Cold War. 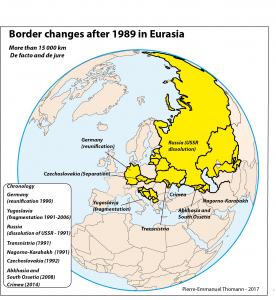 Borders have also disappeared as the border between West Germany and East Germany after German unification, but also between Crimea and the Russian Federation after the integration of the territory of Crimea within Russia. 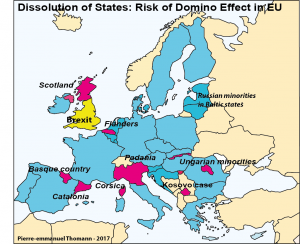 A domino effect is likely to take place in other states under the pressure of national and regional separatist movements in the longer term, but not instantly. An effective independence of Catalonia would politically reinforce separatist political movements in other Member States, in particular in Scotland, Flanders, Corsica, Padania, the Basque Country, and would probably inspire Hungarian minorities in Romania and the Russian minorities in the Baltic countries. On the one hand, the EU is seeking to defend its specificity and its attractiveness, based on values ​​with the promotion of democracy and human rights on which it bases its legitimacy. Yet the limits of the EU's values ​​discourse are reached in the face of increasingly frequent exceptional situations, which oblige the actors to act more forcefully during a crisis. The war of communication with images of violence, real or manipulated, weakens the Spanish government if it applies force and coercion. The promotion by the EU of multiculturalism and minority rights according to the liberal and individualist ideology leads to the balkanization of European nations and prepare future new crises. We can also imagine in a few decades, the scenario in which citizens promoting political and radical Islam are demanding political autonomy, or in a more extreme case, the establishment of a mini-caliphate on a territory of a Member State, as an effect of mass immigration. There is also a post-democratic process in the European Union: Indeed, the accusation of populism for all those who criticize European integration in its present form is reducing the democratic debate. Moreover, the tendency of the EU to focus too much on legal issues hides the geopolitical power relationships that determine the interpretation of the law. This declaration was initially interpreted among the Catalan separatists as a support for the referendum. After the referendum, European Commission Vice-President Frans Timmermans then strongly supported the Spanish government. The Catalan crisis now goes beyond pure legal questions since we are faced with an exceptional situation reflecting the shifting geopolitical forces. The EU itself has adapted to different situations both within the EU (organization of the Irish and Danish successive referendums) and at international level with the support for the secession of Kosovo against the will of Yugoslavia . These past episodes and the image of incoherence or "wait-and-see" attitude from EU at the beginning of the crisis, but also the lack of firmness of the Spanish government before the referendum, gave the separatist more confidence to promote their project. The Catalan separatists, a sizable minority so far, are seeking confrontation to build a nation-state in adversity, and attract more and more militants while the Spanish government will have to react according to its national interests not to lose territory. Even if the Spanish government is on the right side according to Spanish law and its constitution, it will be impossible to ignore a sizable number of Catalan citizens demanding independence. It is also a question of legitimacy. In history, committed political minorities often took the upper hand. When balance of power is shifting, international or EU law is adapted to the new situation. To solve the crisis, the summoning of legal arguments will not resolve the crisis. To avoid a secession or a more serious crisis, a renegotiation of the balance between central and regional political structures is unavoidable. Catalan separatists are seeking to internationalize the crisis and are calling for EU mediation. In fact, hidden agendas are present in the mind of the different actors of the crisis, European federalists included. Other European Federalists welcome the weakening of nation-states as a means of advancing their federalist agenda, with the model of the "Europe of the Regions" in mind. 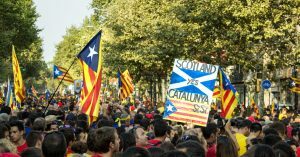 If the Catalan case is more problematic for the EU, the case of Scotland would be good news for European federalists. If Scotland organized a referendum to proclaim its independence after the Brexit, and would apply for EU membership, the federalists could claim that the EU is once again expanding. They could punish the UK at the same time after the Brexit. Reforming the foundations of the EU is a necessary step for the long term survival of the European project and regain the confidence of its citizens. A further weakening of nation-states will be an obstacle to EU reform, as political deadlocks will increase. The European project can only be strong with strong nations since they are facing geopolitical challenges of all kinds. The Balkanisation of the EU states would make it even more difficult to define common interests, and external infringements on their sovereignty would be easier. The crisis in Catalonia has also a disastrous effect on the EU's external policies. Indeed, the EU and most of its Member States have supported the independence of Kosovo, against the will of Yugoslavia and now Serbia. The EU did not recognize the referendum in Crimea, since it led to secession from Ukraine and integration into the Russian Federation. Interpretations of international law changed according to geopolitical circumstances. and the right of peoples to self-determination or the principle of territorial integrity of States have been promoted consecutively in different countries. In reality, the interpretation of international law has changed according to the shifting power relationships. Faced with the Catalan question, these ambiguities are questioning the credibility of the EU past external polices like a boomerang effect. The doctrine of the promotion of democracy also leads to a situation where separatist militants can now abuse of this concept within EU itself. These inconsistencies also reflect the lack of clear identification of EU interests, which has many times aligned itself on the American position for Kosovo and Crimea (Russia and Serbia immediately pointed out these double standards). Strategic autonomy, a return to the doctrine of geopolitical balance and a more realistic approach for EU would in the future avoid more loss of credibility at the international level. – The retreat from separatists, under pressure from the Spanish government, and wait-and-see approach for better circumstances. – The direct takeover of Catalonia by Spain if independence is declared, the dissolution of the Catalan parliament and the announcement of new elections, leading to temporary political retreat of the independence movement. – A situation of paralysis caused by the Spanish government's failure to react after the declaration of independence. There would be a period of uncertainty in which separatist militants would seek to implement a separation process during a few months, in parallel with the drafting of a new constitution. It is however difficult to believe that the Spanish government would let this happen smoothly. 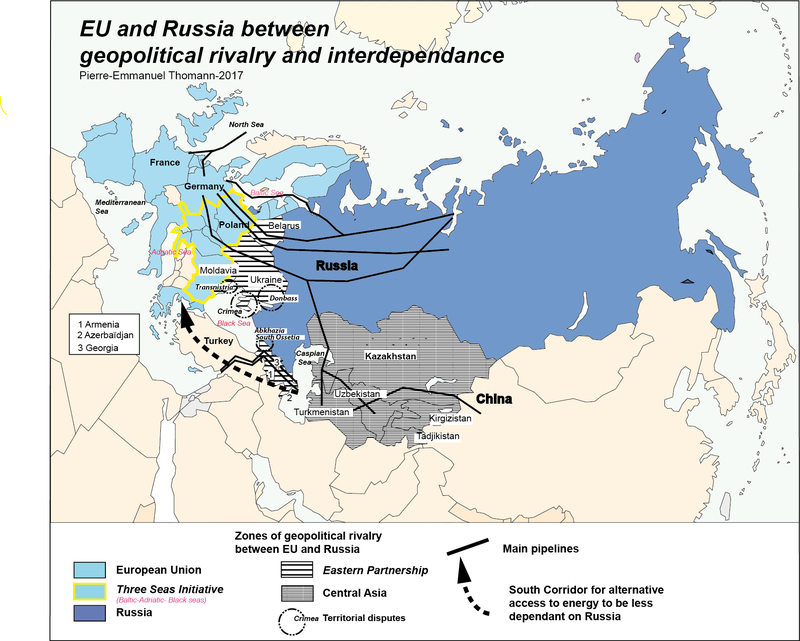 – A political mediation led by a group of states, with the support of the EU. The EU can hardly put itself in the front line since it stated that it was above all a domestic matter for Spain, but they will act behind the scenes. -The acceptance of both sides of a negotiation process to find a compromise between the respect for the unity of Spain and more autonomy for Catalonia. The separatist militants are raising the bids and hope to obtain acceptance by the Spanish government of more favorable conditions, may be the organization of a legal referendum? – The catastrophic scenario of a violent confrontation between the Spanish police forces and the Catalan militias after a political deadlock of the situation, and a process of confrontation similar to what experienced the Basque Country. Catalogne : les défis géopolitiques pour l’UELes « zones de désescalade » en Syrie, une doctrine territoriale au service de la stabilisation des conflits ?